FCCISL is the rallying point for free enterprises in Sri Lanka . It has empowered Sri Lankan businesses, in the changing times, to show up their competitiveness and enhanced their national and global reach. With a nationwide membership of over 63 chambers of commerce and business associations, FCCISL espouses the shared vision of Sri Lankan businesses and speaks directly and indirectly to over 25,000 business units. It has an expanding membership of enterprises drawn from large, medium, small and tiny segments of manufacturing, distributive trade and services. FCCISL maintains the lead as the proactive business solution provider through research, interactions with the government and through global networking. Set up in 1973, FCCISL is the largest and most representative apex business organization of Sri Lankan business. It is also the most widely spread business organization with member bodies from all districts and provinces of Sri Lanka . 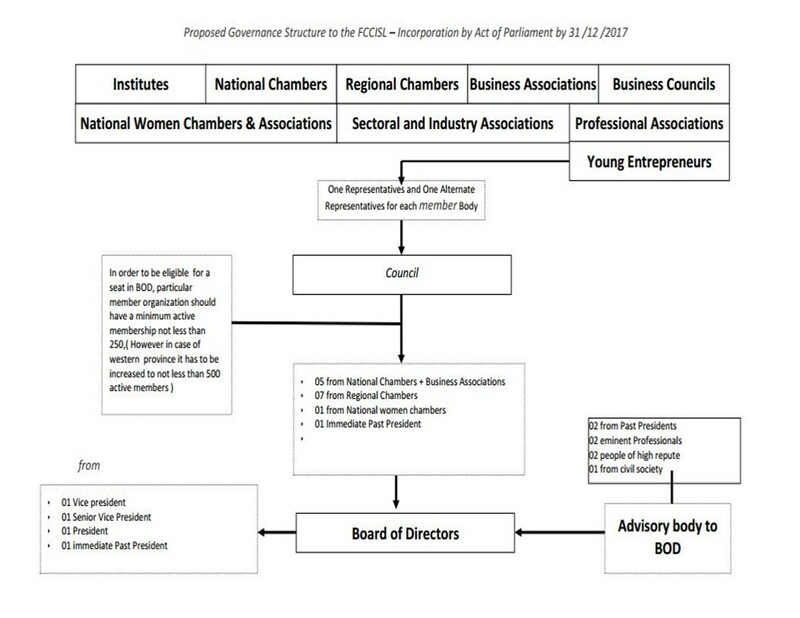 As an umbrella organization of the private sector, the FCCISL has been playing a key role in promoting business and industry in the country by providing the member bodies with a wide spectrum of services ranging from advisory, consultative, promotional, information sharing and representative services. The FCCISL’s commitment, drive and mission continue in the ever-changing economic landscape of Sri lanka , chasing always a newer agenda. In the knowledge-driven globalized economy, FCCISL stands for quality, competitiveness, transparency, accountability and business – government-civil society partnership to spread ethics-based business practices and to enhance the quality of life of the common people. (1) Strategy-Intervention on national issues /International relations /membership development / capacity Building. (2) Sustainability and Risk Management-Finance and Audit /sponsorships and fund raising / training and education/ publications and staff benefits . Each member organization will get the membership by virtue of the fact that they become members. From each member organization there will be a permanent representative and another alternative member to represent the said chamber/association etc. Minimum (3) maximum (5) members representing the business community to advise the board on scope of the finance reporting system and management of fixed assets. FCCISL Advisory Committee was set up to further strengthen the vision and mission of the FCCISL -apex body of the Sri Lankan chamber movement. The advisory committee will consist of prominent entrepreneurs and business professionals in the country and expected to play a key role in shaping up the future of FCCISL. Steering the Federation of Chambers of Commerce & Industry of Sri Lanka (FCCISL) is its dynamic council comprising of eminent & respected professionals in the commerce and industry sector of the country. As the highest policy making body, the council ensures that the most appropriate policies, guidelines and directions are established and continuously review the operations of the FCCISL in order to ensure that the institution is able to meet pre-determined organizational goals. The council consisting of two representatives of each member body which include the President, Senior Vice President & a Vice President who have a tenure of 2 years each. Among the many responsibilities of council members; representing its membership at various high-profile local and foreign forums, leading/contributing at important sub-committees & standing committees, lobbying and acting as a conduit to facilitate information sharing between its membership and policy making bodies are significant. Highly qualified multi-disciplinary Secretariat consisting of graduates, MBAs, IT professionals, fiscal and financial analysts, lawyers, etc., who can provide business solutions and guidance on industry issues like productivity, quality, market access, taxation, economic policies, etc. The intellectual capital is ever-expanding to address newer areas and wider issues.